Do you still plan to release the movie? Will Robotic Chuck Norris make an appearance? Are you still currently working on this project, and if so, is there an estimates release date. Also, will we be seeing new music from Reel Big Fish in the film? How much has been donated, so far? Lastly, are there and/or have there been funds coming from elsewhere? Unfortunately, Robotic Chuck Norris does not have a leading role in The Waterman Movie, however that doesn’t necessarily mean that our favorite robotronic sheriff doesn’t appear in the movie in one way or another. Are you asking about the movie or in general? For The Waterman Movie we are working with the talented wizards at CJC Entertainment to animate the film. Generally speaking, we are always on the look out for both talented individuals and studios to help bring our creations to life! 1.) Yes. We have been keeping track of everyone that has been generous enough to donate and will announce the winner once the movie officially goes into production. 2.) We have been able to raise a good amount of money through donations since the end of the Kickstarter campaign. We still need a lot more to get this project off the ground though. 3.) Unfortunately, there’s not much to report in terms of any other outside funding at this time. I really wish there were but nothing yet. Thanks for your questions Jeffery! Thanks for your inquiry zombie grandmother! Has any of the movie been finished beyond the first two minutes? how well did you get to know Leslie Nielsen before he passed away? Sorry for the delay in response! You can certainly expect the enchanting melodies of Reel Big Fish will make an appearance. As far as an original score, we have been in talks with several talented individuals to provide music for the movie. As of right now the first two minutes are the only “finished” minutes of the movie. More than anything the movie is basically a mass compilation of pre-production elements at the moment. First let me apologize if people used Mikkila Gorilla as a nickname to bully you with as a child. To answer your question, very well. Contrary to popular believe, after Leslie recorded his lines for the movie we didn’t lose contact. We stayed in touch and spoke on the phone just about every month for years. He went from being my childhood idol, to a good friend and I will forever cherish the time that I got to know him. Good question! All of the original actors are returning to voice the characters they played in the series. Chris Barnhill will return as Pal, Katie Dorr will reprise her role as the Ice Cream Girl, Devin Farmer will continue to play himself, and I will be providing the voices for Waterman, Mr. Dillo, Roy-Bot, and Raccoon. Last, but certainly not least, Leslie Nielsen provides the voice for famed explorer Ready Espanosa. There are also some surprises in store as well, but we’re keeping that secret for now. What was the result from the last kickstarter campaign? I’m assuming it did not gather the required funds (much to my extreme dismay). How long will the finished movie be? 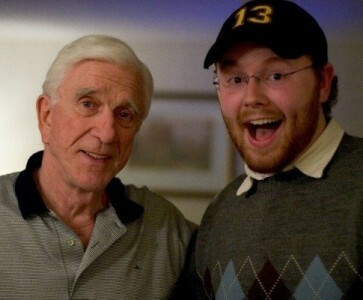 Sorry to hear about the passing of Leslie Nielsen, what will you do with his passing? I mean what do you think you will do if you get stuck and need to add more scenes…or something? When do you see the film being complete and released? And with the movie DVD will you have the original episodes…. In there original versions, on the DVD as well? …That would be worth the buy! Was the cow killed in Elem Klimov’s 1985 War Movie “Come and See” actually killed? Big fan of your stuff. I’ve been following your work since middle school. Anyway my question is approximately how much would it take to get the Waterman Movie moving back on track? will it be released in the uk or is it U.S.A only? will this movie be released in theaters? or is it a straight to DVD or online feature? On a scale from 1 to 10 with 1 being petting a puppy and 10 being trying to disarm a bomb and also being held at gun point. How stressful has this movie been? Will there be a puppets in the park intermission? Lastly, What are your top 3 Leslie Nielson movies? Great questions! Let’s see if I can satisfy your questionary lust. Q1: On a scale of 1 to 10 with one being petting a puppy and 10 being trying to disarm a bomb and also being held at gunpoint. How stressful has this movie been? A1 (Steak Sauce): I would describe production as being a solid middle ground between your two extremes. It’s a lot like disarming a bomb designed by a puppy while a puppy holds a gun to my head. Part of me really hates that puppy for planting a bomb, but at the same time it IS a puppy, so how mad can I really be? However, that same puppy is basically threatening my life twice in the same situation…soooo. I guess what I’m trying to say is that it’s been a challenge, but nothing in this world worth having comes easy. And that’s how a caterpillar becomes a butterfly. Q2: Will there be a Puppets in the Park intermission? A2: Unfortunately, no. That’s not to say it may not pop up somewhere though. Q3: What are your top 3 Leslie Nielsen movies? Thanks again for the awesome questions Ross! There is a good chance that the movie will be hitting all of those venues. Congratulations again on your knighthood. May I call you Gregors? I’m going to. First off, thank you for your kinds words regarding my previous adventures. As for your question, are you referring to how much money it would take to assist production? If we are not talking in terms of shillings, the following would obviously be required. 38 small stones, 472 pieces of vein-thin copper piping, 1 common house cat, 14 wooden skeeball balls from a local carnival, 39.6 pounds of turquoise sea glass, 86 Peruvian leather hides (preferably hawk leather,) 3 pairs of orange Crocs melted down into the shape of one large circus peanut, 900 steel jars (stolen,) 34 unopened Swiffer duster refills, 18 tankards of ale, 1 gunny sack of Vandalion sand, 1 mermaids tear, 365 stands of monkey hair, 1 bucket (gray,) 9 right foot bowling shoes, 1 set of “dead man’s chungs,” 16 children’s tackle boxes, 3 canisters of “Black Barron Shoe Polish for Elders, and of course a couple of horse-sized fins. If you were in fact talking in terms of monetary value, any amount would help continue to move production forward. Thanks for your question Chin! I can assure you that childish video games like BATTLEFIELD 3, PORTAL 2, ASSASSIN’S CREED REVELATIONS, RAYMAN ORIGINS, BATMAN: ARKHAM CITY, and DANCE CENTRAL are all awesome and wildly distracting. The movie should be coming in around ninety minutes. Just like a real one! Movie, that is. Just like a real movie. Boy, this whole part of my answer seems very unneeded. Anyway, while I have you here, could you pick up a gallon of milk on your way home? Wait a minute. WHO IS THIS! You’re not Barbara! WHAT HAVE YOU DONE WITH MY WIFE. And that’s how strange those ninety minutes will be. by any chance will we get to see this movie before the mayan apocalypse? and if so will it be getting a DVD release or a theater release? In the series there was an awful lot of cut away humor. Is the movie going to follow the same Family Guy-esque approach? Hi Bryan i was wondering how many koala will be in the movie? What’s the movie’s production status? When will there be a new trailer? And if you’ve been in touch at all with anyone in Nielsen’s family, have they been supportive of the film? Do you actually have the funding for the movie? Just wondering since I’ve seen these kickstarter videogame projects getting from 200,000$ to 3,000,000$, based on just promises. This one would be so easy to get funding for and I wanna see it. I’ve always loved your work. I noticed in another post you are working on putting the old episodes up. Any chance you can put up Who Wants to Be a Pictionary Millionaire? and Puppets in the Park too? I seen this movie when I was a kid and I cant remember the name of it, maybe you can help me out. It was about this boggie, he would come out from under the bed ( just lift the bed up like a door). If he got in the sunlight he would just turn into a pill of clothes. This boogie man and the kid he was suppose to be scaring became friends and he took this kid to his world under the bed with him. I know sounds weird but I just cant remember the name of this movie and its driving me crazy, and now that I told my kids about they are diving me crazy cause they want to see it. So I know that making a movie costs money and such, but seriously. What is the real delay? Will this be the last of the Waterman series, or will there be more after the movie? What’s even funnier, is your inability to read. But, with a name like Peen I guess I’m not all that shocked. In the movie “Cancel My Reservation” (Bob Hope, Eva Marie Saint 1972), there is a large house featured on the fictional “Strawberry Ranch”. Does anyone know where this house actually is (was)? Any information would be great. in the movie the Fugitive models were walking on the catwalk what was the name of the music that was playing? I have some terrible news. As the Mayans never took into account Daylight Saving Time, as well as many other space age nonsenses, their predicted Apocalypse should have happened sometime last year. So to answer your question, no. However we are making excellent progress and I can tell you that an end is definitely in sight. When the movie is finished we will absolutely be releasing it onto both DVD and Bluray and would love to do some sort of limited theatrical release. Excellent question! “The Waterman Movie” is completely void of cutaways. Everything takes place in the here and now (or the there and then.) Much like the final episode of the “Waterman” series, the movie is very character driven. Funny story, I actually went to High School with a guy name Splontot. He was the worst. You better not be him. Anyway, to answer your question, I don’t know. “The Waterman Movie” was always meant to be the final chapter in the “Waterman” saga but anything could happen. If the movie does really well or there’s an overwhelming number of people wanting more, who knows. Right now we’re taking it one step at a time. Well you are not taking magic into account, Bryan. Do you have any plans for the Waterman series after the movie? Im trying to figure out the name of a movie…all i know about it is that there is a party at a house that a serial killer grew up in. He comes back dressed in a mask and shows up to the party and starts killing people. Do you have any idea what its called?? Hi I donated money back in 2010 any updates? Just a Waterman fan wondering if the project was dead, or just stalled. Have you tried a Kickstarter or Indiegogo to get whatever funding you need to finish it? I’d think that with the Leslie Nielsen thing and the body of work (as proof of concept) already done, it’d probably do pretty well. Many times over the years I have search the internet for the name of a movie – any help greatly appreciated. Late 70′s early 80′s – I remember only one clip – “If memory serves correctly I feel like the movie was in a country or small town setting and I recall a Pregnant (maybe blonde – maybe with an alien child) woman goes into a library and touches the sides of each book and realizes she has read the entire book by simply touching it and continues to touch each book.” I saw this on TV around 1979-1983 like one of the Saturday or Sunday afternoon movies (abc or cbs did back then) not sure if this was made for tv or a theater film on tv.